An ice maker can be quite a convenience both for homes and for offices, and clearly a necessity for restaurants and bars. But it can also become a bother if its noise output is too much to handle. For those looking for the quietest undercounter ice maker, each of the ice makers on this list has a customer rating of at least 3 stars and have a low noise output – they practically purr! Only 7 products met these criteria, we’re going to talk about their size, ice making capacity, and usability in this article. This Whynter ice maker model is smaller than the one that took the first spot as the best undercounter ice maker. It can make up to 23 pounds of crescent-shaped ice per 24 hours. 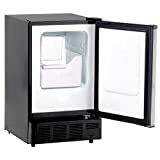 The unit automatically shuts off when the ice container is full but ice doesn’t melt inside the container, so there is no drain line necessary. The dimensions of this model are 16.2″ wide by 14″ deep by 24.5″ high and its out-of-package weight is 52 pounds. Like the other models on the list, it has a front-facing vent so it can be installed between two cabinets. This model also features a high-efficiency CFC-free compressor and is UL listed. This model makes up to 50 pounds of ice per day and can store 25 pounds at a time, automatically shutting off when the container is full. It has the front-facing exhaust, so it can be installed under the counter or freestanding. This manufacturer specifies that filtered water must be used for this ice maker and recommends using a licensed plumber to install it as the installation of its water supply might be too difficult for some users. The appliance is 23.6″ wide by 14.6″ deep by 32.8″ high, weighs 84 pounds, and does require a drain. This Whynter ice maker makes up to 50 pounds of ice cubes in 24 hours, stores up to 25 pounds, and automatically shuts off when the storage container is full. Dimensions are 15″ wide by 24″ deep by 33″ high and its out-of-package weight is 77 pounds. 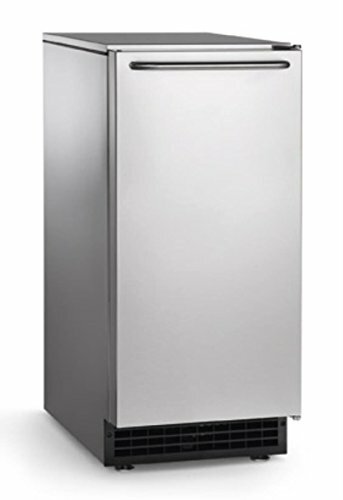 Whynter’s UIM-155 ice maker can be used as a freestanding appliance. Alternatively, it can be installed under a counter. It’s ventilated in the front so that it can be installed with cabinets on either side and it also comes with a water hose and drain line. 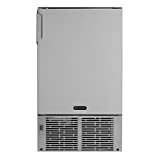 Although the decibel level of this appliance is not specified, customers report in their reviews that it is among the quietest undercounter ice maker options. This undercounter ice maker produces up to 12 pounds of ice per day. It can be installed as a freestanding appliance but is front-vented and, therefore, fit for undercounter installation with cabinets on either side. 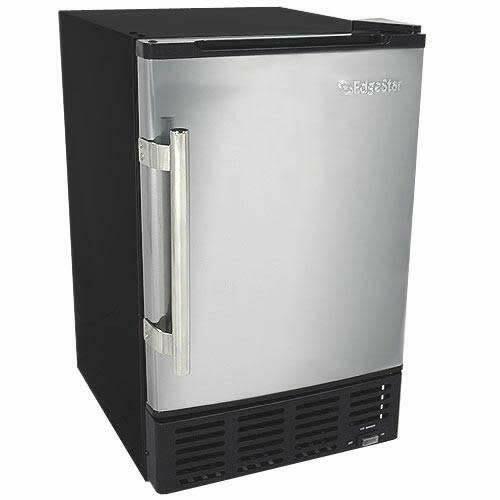 EdgeStar’s IB120SS Ice Maker weighs 54 pounds when taken out of the packaging and measures 15″ wide by 18.5″ deep by 25.25″ high, which makes it compliant with the Americans with Disabilities Act. It doesn’t come with a drain or a drain line, because according to the product specifications, ice never melts inside the machine! This unit weighs 153 pounds and weighs 28 x 30 x 38.5 inches. 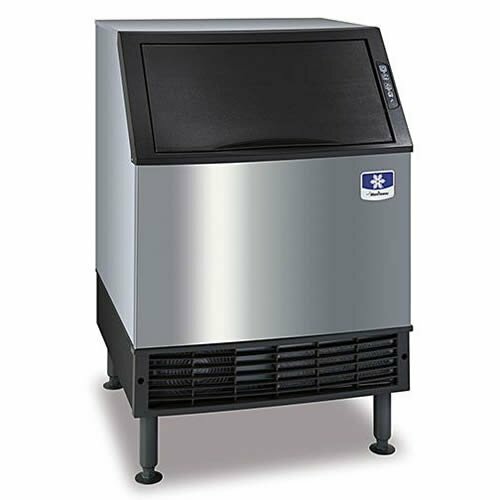 According to customer reviews and specs, it makes approximately 10 pounds of ice at a time with a daily total output of 304 pounds and is one of the quietest undercounter ice maker choices available this year. Customers report that it’s noisiest when the ice first drops into the empty bin, but relatively quiet otherwise. It can be used as a freestanding ice maker or installed under a bar or counter since it vents in the front. Scotsman’s CU50GA-1A ice maker is 22″ wide by 14.9″ deep by 34.4″ high and weighs 112 pounds (shipping weight). 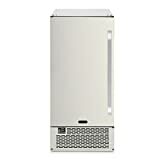 The ice style is cubed, and according to customer reviews, this is among the quietest undercounter ice maker models. Reviews suggest it’s rather quiet except for the sound of the ice dropping into the collection container. Oddly enough, the volume of ice produced per day isn’t included in the product specifications. This model is approved for outdoor installation, so it can be used as part of an outdoor kitchen. It has a water quality sensor, helping the consumer know when it’s time to replace a water filter for a continued high quality of clear ice. The water filter is not included as part of the ice maker, but consumers can choose to add a filter to the water line. The varying specifications provided by the different manufacturers make it a bit difficult to make an apples-to-apples comparison between each of these 6 models. 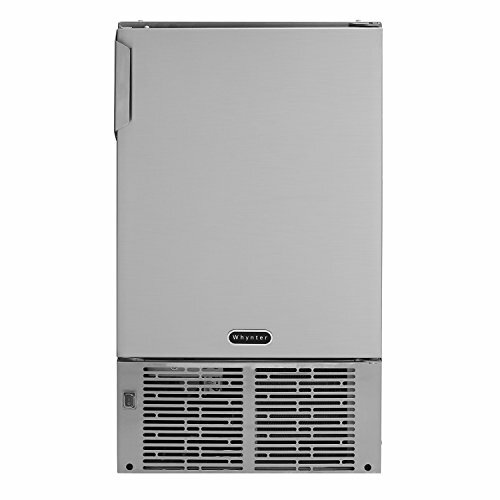 If you’re looking for the quietest undercounter ice maker, consider the Whynter UIM-502SS, the Manitowoc NEO UR-0140A, or the Scotsman CU50GA-1A, all of which were called out as being among the quietest undercounter ice maker options in customer reviews. If you want to install the ice maker in an outdoor kitchen, you’ll want to look at the Scotsman, the only model on the list that’s specifically listed by the manufacturer as being approved for outdoor installation. Do you have other suggestions that were not included in this top? Let us know in the comments section! I am looking for the quietest undercounter ice maker and I am unsure of what recommendation to go by. All I know is that the last one I had, it was too noisy and extremely distracting. I can’t have that again. Hi, Ashley! We suggest you try the Scotsman CU50GA-1A, as most users have been very satisfied with it. However, you really can’t go wrong with either of the options on our list. I will second that, the Scotsman CU50GA-1A ice maker is incredibly quiet and that is one of the best features. A noisy ice maker is very distracting and when you have guests over, they don’t want to really hear the racket. I recommend you get that one if the noise is an issue for you. Thanks a lot for your feedback. We couldn’t agree more. There is no question that Whynter makes the best undercounter ice makers ever. They are so quiet you have no idea that anything is running. Not to mention, it can produce a generous amount of ice. To me it wins. Thank you for your feedback on the Whynter ice maker, Chloe! The Whynter ice maker model is small but it is efficient and takes up little space as a result. This ice maker is perfect for my needs, and for anyone else who does not care about it being all that fancy. Hello, Billy! We appreciate you letting us know about your personal experience with one of our suggestions. My ice maker makes a racket and I am looking for a quiet one. This list looks good but now it is all going to boil down to choosing the right one and I have no idea where to even start with that. Hi, Jackie! We suggest reading other customers’ reviews as well when choosing any type of product. We use the Scotsman’s CU50GA-1A ice maker outside as we have an outdoor living area, as we have plenty of parties. It works great, and I highly recommend that you get an outdoor tv and if you havn’t gotten your deck all jazzed up, then I suggest you do. It is worth the money, because it is absolutely cool to host parties outdoors and to hang out. The ice maker is a great addition. Thank you for your input, Sammy! The Whynter ice maker is compact and small and very quiet. I have had this one for years and have been satisfied with how well it works. I highly recommend that you purchase this one as well if you want a quiet and compact machine.